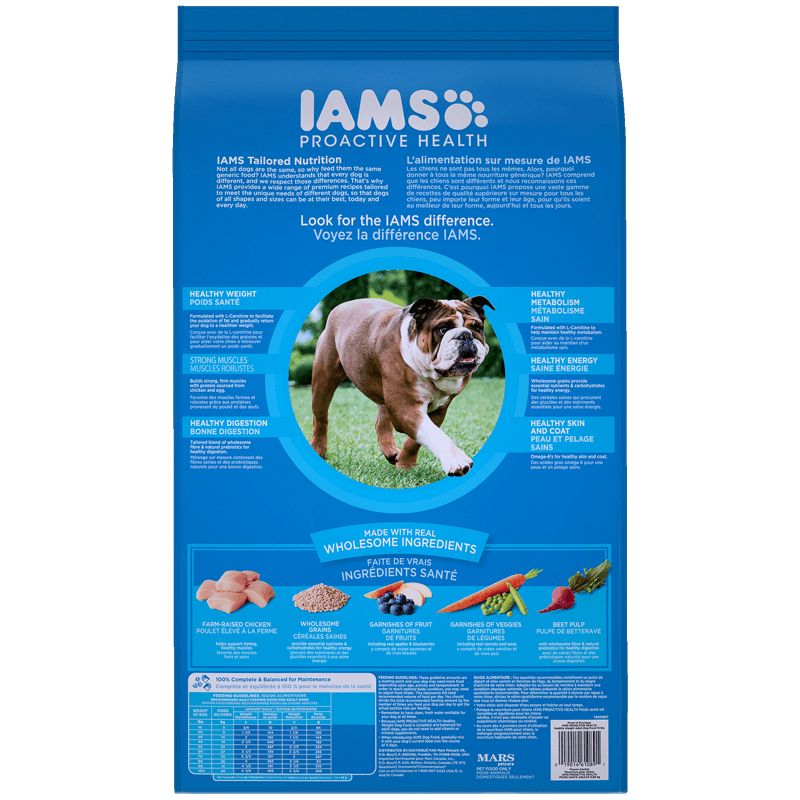 IAMS Weight Control returns your dog to a healthy weight with fat-burning L-carnitine that helps turn fat into energy, providing a path to keep him fit for life. This is a great alternative to the HEALTHY NATURALS™ WEIGHT MANAGEMENT. Here you’ll find the same high-quality, tailored ingredients that ensure your dog is always at his or her unique best. Find out more here, or use the Product Selector to find the recipe best suited to your dog’s specific needs. Formulated with L-carnitine to facilitate the oxidation of fat and gradually return your dog to a healthier weight. Formulated with L-carnitine to help burn fat and maintain healthy metabolism. Tailored fiber blend, including prebiotics and beet pulp, for healthy digestion. Nourishes the heart with 7 essential nutrients. Corn Meal, Chicken By-Product Meal, Ground Whole Grain Sorghum, Chicken, Ground Whole Grain Barley, Dried Beet Pulp, Chicken Flavor, Chicken Fat (preserved with mixed Tocopherols, a source of Vitamin E), Dried Egg Product, Brewers Dried Yeast, Potassium Chloride, Salt, Choline Chloride, Flax Meal, Calcium Carbonate, DL-Methionine, Fructooligosaccharides, Minerals (Ferrous Sulfate, Zinc Oxide, Manganese Sulfate, Copper Sulfate, Manganous Oxide, Potassium Iodide), L-Lysine Monohydrochloride, Vitamins (Vitamin E Supplement, Ascorbic Acid, Vitamin A Acetate, Calcium Pantothenate, Biotin, Thiamine Mononitrate (source of vitamin B1), Vitamin B12 Supplement, Niacin, Riboflavin Supplement (source of vitamin B2), Inositol, Pyridoxine Hydrochloride (source of vitamin B6), Vitamin D3 Supplement, Folic Acid), Dicalcium Phosphate, L-Tryptophan, L-Carnitine, Citric Acid, Rosemary Extract. These guideline amounts are a starting point and your dog may need more food depending upon age, activity, and temperament. In order to reach optimal body condition, you may need to adjust food intake. This represents the total recommended volume of food per day. You should divide the total recommended feeding amount by the number of times you feed your dog per day to get the actual portion size per feeding. Feed this formula to dogs weighing 50 lbs. or less that are overweight or have lower activity levels. 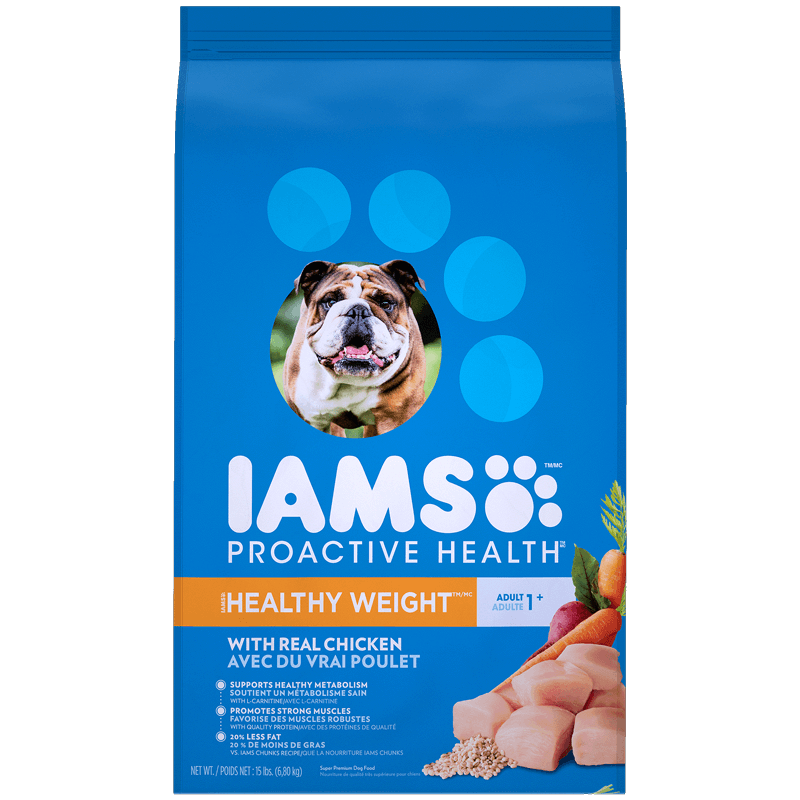 Because IAMS ProActive Health Weight Control dog food is complete and balanced for adult dogs, you do not need to add vitamin or mineral supplements. 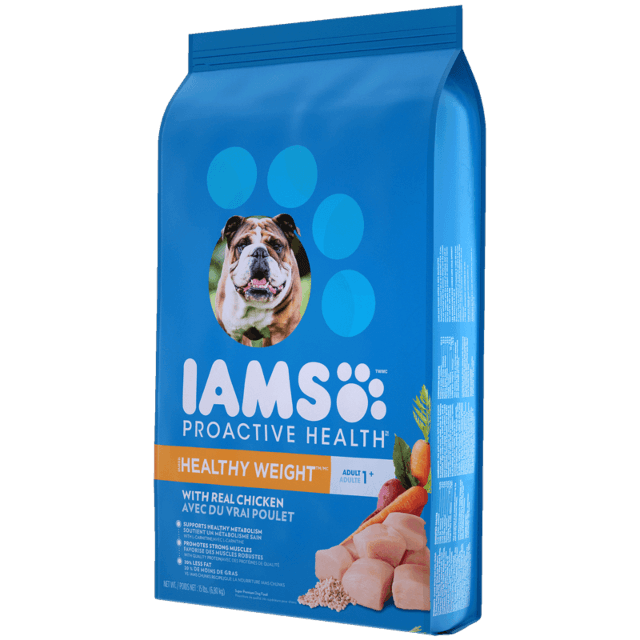 When introducing IAMS dog food, gradually mix it with your dog's current food over the course of 4 days.